Your genes affect a lot more than just the way you look. They can also play a major role in your health. From poor eyesight to certain kinds of cancer, many different health issues tend to run in families. And while there’s never any way to know for sure whether or not you’ll experience a certain health problem, it’s smart to be aware of your family history, so you can know what symptoms to look out for. If someone in your family has had deep vein thrombosis (DVT), you might be concerned about whether the condition is genetic. Does a family history mean you should worry? If so, how much? While we don’t have a clear-cut answer to this question yet, the research that’s been done so far has identified certain genes that are linked with DVT. In other words, if a family member has had DVT, it’s wise to be on the lookout for symptoms in yourself. Here’s what you need to know about your odds of inheriting DVT. Deep vein thrombosis, or DVT, is a condition that occurs when a blood clot forms in one of the deep veins in the body. Usually this happens in the legs. DVT can cause pain, swelling, and a sensation of warmth or tenderness in the affected limb, but sometimes it causes no symptoms at all. Sometimes, a blood clot can stay stuck in the vein where it formed for months or even years. This is known as chronic deep vein thrombosis. Chronic DVT can block the flow of blood in a limb, leading to swelling and pain. 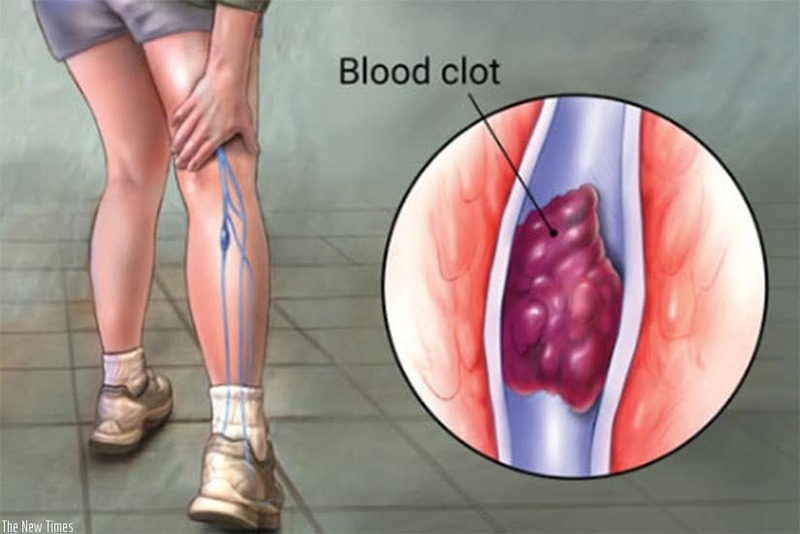 While this condition is serious, DVT is even more dangerous when the blood clot does not get stuck. If the clot dislodges from the vein where it formed and travels to the lungs, it can block the flow of blood there – a condition known as a pulmonary embolism. A pulmonary embolism is considered a medical emergency, and it can be fatal even with quick treatment. A number of different factors can cause or contribute to deep vein thrombosis, and many of them have nothing to do with genes. Here are some of the main causes of DVT. Injury or disease that affects blood vessels. A family history of DVT. When you don’t move around for long period of time, your blood can’t circulate as effectively. This increases the risk of a clot forming. For instance, you’re more likely to develop DVT if you’re on bed rest or traveling in an airplane. Any kind of blood vessel damage can increase your odds of getting a clot. This includes conditions like varicose veins and vasculitis, as well as broken bones and smaller injuries like ankle sprains. If you have a condition that makes your blood clot more easily than other people’s, you’re at increased risk for DVT. Genetics often plays a role in blood clotting disorders. Taking oral birth control pills and getting hormone replacement therapy can make you more susceptible to blood clots. Being pregnant makes a woman’s blood clot more easily. If you smoke, live a sedentary lifestyle, or are overweight or obese, you’re more likely to get DVT than someone with a healthy lifestyle. You are more likely to develop a clot if one of your parents or siblings has had DVT, especially if they were under the age of 45 when they developed it. Clearly, there are a lot of different factors that can play a role in the development of DVT. The good news is that many of them are controllable. While you can’t do anything about your genes, you can adopt some lifestyle habits that lower your risk of getting blood clots. Here’s what you can do to minimize your odds of getting DVT, regardless of your family history. Exercise regularly. Even gentle exercise will help protect you from blood clots. Get up and walk around every hour or so when you go on long trips. If you need to have surgery or go on bed rest, ask your doctor if you should take blood thinners to lower your risk of developing a clot. There’s no way to predict for sure who will get DVT and who won’t. Your genes can raise your risk, but many people with a family history never get DVT – and many people with no family history do develop the condition. One way to assess your risk is to look at all your risk factors. If you have a family history of DVT, but you live a healthy, active lifestyle and take precautions to minimize your risk of blood clots, you probably don’t have to live in fear of developing DVT. Just be aware of its symptoms, and call your doctor right away if you think something might be wrong. On the other hand, if you’ve got two or more of the risk factors listed above, it might be time to start thinking about what you can do to lower your risk. A family history of DVT in addition to an environmental risk factor like a sedentary lifestyle can make you 64 times more likely to develop DVT than the average person. For many people, that’s too big a risk to take. If you need help finding ways to lower your DVT risk, tell your doctor about your concerns. Ask them to help you identify some lifestyle changes you can make to reduce your risk of developing DVT.